SMART CUT™ Precision Diamond Sectioning Saws & Diamond Wafering Blades have been successfully implemented and proven in hundreds of advanced materials and applications. SMART CUT™ Precision Manual and Semi-Automatic Saws provide Advanced Material Laboratories and Manufacturing Facilities consistent performance as fully automatic saws, fraction of the cost. With ever increasing budget cuts, many facilities find the use of Precision Sawing/Sectioning Equipment and Consumables cost prohibitive. 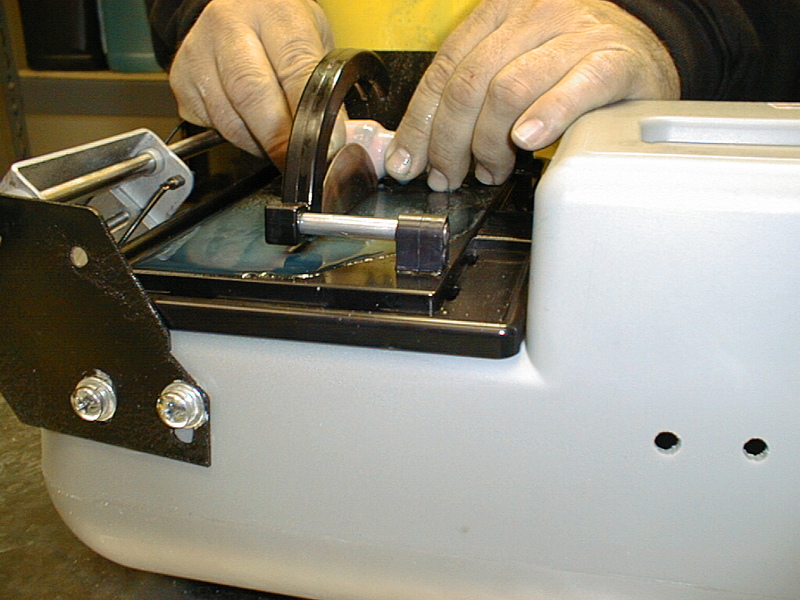 Fully automatic Precision Sawing machines usually cost thousands of dollars. Yet, most advanced material facilities very rarely require the functionality of high cost, automatic sectioning saws. SMART CUT™ series of Precision Diamond Saws have been designed to provide the material researcher or engineer the same capabilities they would expect from high cost automatic sectioning saws, at fraction of the price. Start Saving Money Today! Application: sectioning alumina oxide gas cups. Material Length: 1.8" Material Diameter: 1.21"
Customer Objective: Precisely section 0.400" of material tubing without damaging structure of material. Customer originally believed a low speed saw was the only viable solution. 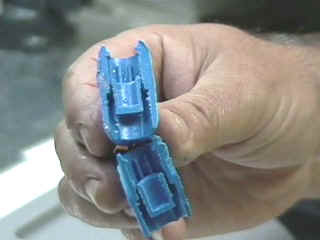 Cutting Speed: customers advanced ceramic tubing was sectioned at approximately 27 seconds. Surface Finish: a smooth cut was produced, with no visible chipping on edges, structure of ceramic tubing remaining in tact. Diamond wafering blade with 220 mesh was used for this application. Conclusion: Customer saved several minutes per cut, utilizing SMART CUT 4002 Precision Diamond Sectioning Saw. Compared to sectioning this specimen using a conventional low speed Sectioning Saw. Customer saved Money and Time using SMART CUT 4002 Precision Diamond Saw. Customer Objective: Precisely section samples in half for quality control / sample preparation without damaging structure of material. Without burring. Diamond Wafering Blade Used: Electroplated with interrupted coating, core steel with memory. 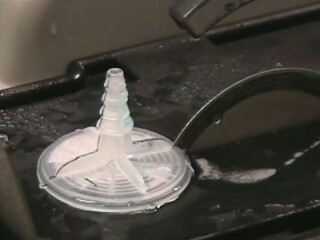 Cutting Speed: customers polyethylene sample was sectioned at approximately 20 seconds. Surface Finish: a smooth cut was produced, with almost no burs on edges. Conclusion: SMART CUT 4002 can meet customers objectives in sectioning various size hard to machine plastic samples in matter of seconds, while still preserving material true micro structure. Material Length: 2.3" Material Thickness: .125"
Cutting Speed: customers polyethylene sample was sectioned at approximately 1:43 minutes. Customer Objective: Precisely section substrates in half, minimizing chipping and material pull out particularly on backside. 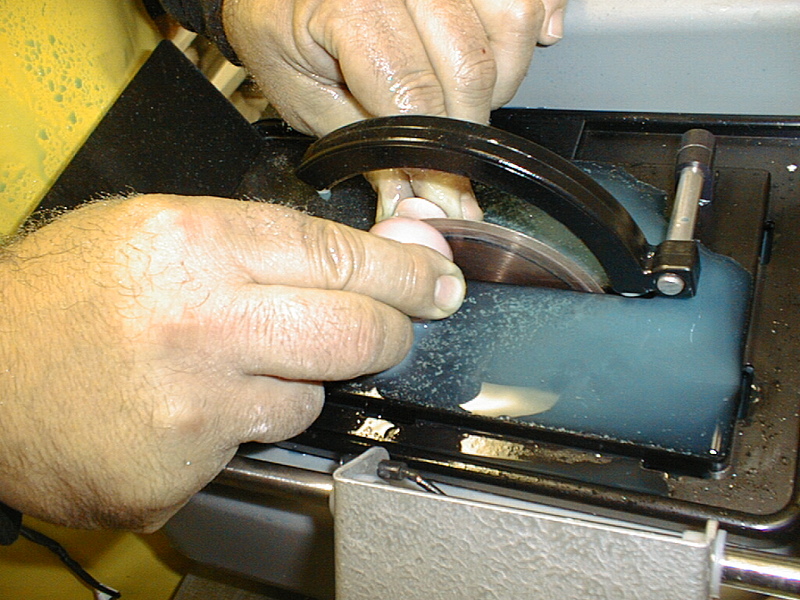 Cutting Speed: customers quartz substrate was sectioned at approximately 29 seconds. Surface Finish: a smooth cut / surface finish was produced, with almost no visible chipping. Conclusion: SMART CUT 6001 can meet customers objectives in sectioning optical glass / quartz in matter of seconds, producing smooth surface finish & superior quality cut compared to other or traditional diamond cutting methods. Customer Objective: Precisely section metal solid tube into 1/4"" lengths as fast as possible, without burrs. Cutting Speed: customers steel tube was sectioned in 11 seconds. Surface Finish: a smooth cut / surface finish was produced, with almost no visible burrs. Conclusion: SMART CUT 1004 diamond cut off saw can meet customers objectives in sectioning metallic materials in matter of seconds, producing smooth surface finish & superior quality cut, and minimal kerf / loss of material compared to other or traditional abrasive cutting saw & blade cutting methods. Customer Objective: Precisely section sapphire rod into 0.5mm slices without chipping or burring. This client wishes to have a very straight and perpendicular cut. Customer Objective: Precisely make 3 even spaced slots at same time on each wall of the glass tubing. Without chipping, burring, cracking. This client wishes to have a very straight and perpendicular cut. Sectioning Method Used: specialized material holding fixture that feeds glass tube into three evenly spaced rotating blades, allowing control of slot depth and position and rotation of tube to other side to finish the operation from others side. Conventional Diamond Wafering Blade: is a well known "Brand Name" Diamond Wafering Blade in metallography, material science, & sample preparation industry.